The wake of the cancellation of NASA’s Constellation Program has been devastating to Lockheed Martin’s Orion spacecraft plans. They had been counting on the subsequently-canceled Ares series of rockets to loft Orion to the International Space Station (ISS) as a replacement for the retiring Space Shuttle, with eventual plans as the command module for future manned exploration of the Moon and Mars. After emerging from beneath the Obama administration’s scalpel, (one that admittedly may have simultaneously opened a new channel for commercial space exploration,) all that remains of this once mighty program is the go-ahead to leverage the Orion testing already done so that a stripped-down version might be utilized as an ISS lifeboat. However, instead of licking their wounds, it appears that Lockheed Martin has wasted no time in capitalizing on their salvaged Orion spacecraft-as-lifeboat. 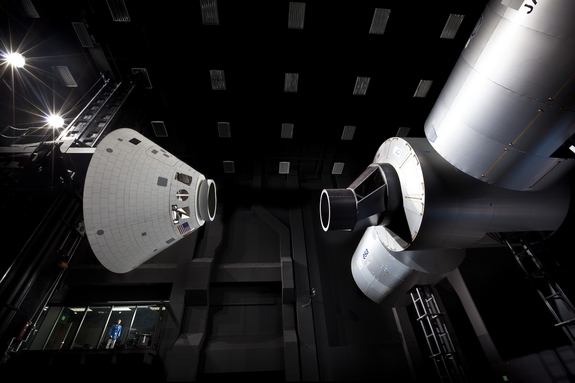 First, they’ve recently unveiled a new facility designed for full-scale testing and integration of Orion with spaceflight hardware, called the Space Operations Simulation Center. 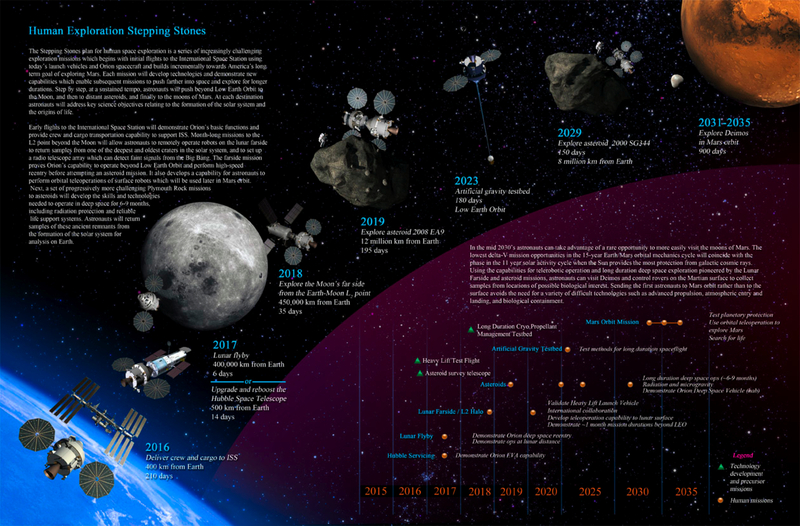 Secondly, and perhaps more intriguingly, they’ve release a document called “Stepping Stones,” which is a Lockheed Martin proposed scenario that includes a timetable for incremental missions from Low Earth Orbit to an eventual exploration of a moon of Mars (see image above). Using tried techniques, the outline builds on their previously-released Plymouth Rock scenario and includes an earlier mission to repair the Hubble Space Telescope, a subsequent mission to the Lagrangian Point over the far side of the moon, a more distant asteroid rendezvous mission, and finally a mission to the moons of Mars, enabling astronauts to control robotic rovers on the Martian surface in real time. Aside from the fact that logistically, scientifically, economically, and technologically there are very good reasons to visit asteroids, even the final objective sets very technologically realistic goals. 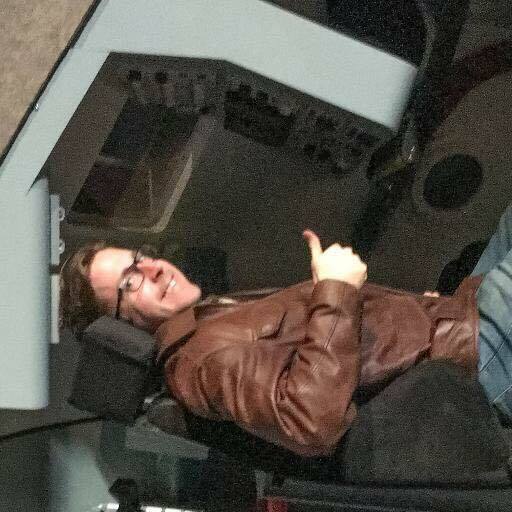 By not shooting to put boots on Mars to begin with, their very savvy scenario bypasses the need to utilize the risky, untried hardware that would be necessary to make a powered landing on the Martian surface and blast off again (presumably to a Martian-Orbit-Rendezvous) before heading back home. I sincerely hope someone with vision and budget authority picks up this proposal – it’s a serious plan that continues to grow our experience and knowledge base by visiting (and mastering travel to-and-from) new destinations while minimizing risk. With Stepping Stones, I think we’re looking at the future of manned space exploration.